Photoshop Elements 12 provides you with a great opportunity for organizing files, in the form of tags. After you acquire your images in the Organizer, you can sort them and add tags according to the dates when you took the pictures, the subject matter, or some other categorical arrangement. In the Organizer, the Tags panel helps you sort your pictures and keep them well organized. You use the Tags panel to identify individual images by using a limitless number of options for categorizing your pictures. 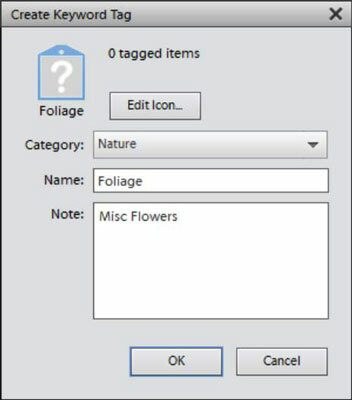 On this panel, you can create tags and collection groups to neatly organize files. In Photoshop Elements 12, tags have been refined. Earlier versions of Elements offered a panel with tags listed in a linear order and non-grouped. With Elements 12, the Tags panel is divided into four categories, as shown in the figure: Keywords, People Tags, Places Tags, and Events Tags. Elements helps you organize your photos into these four main categories, and each category has a drop-down menu you can use to create new tags and add new subcategories. 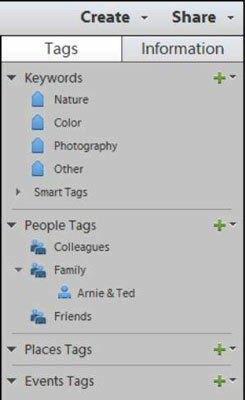 To create a new tag, choose which category you want to use (Keywords, People Tags, Places Tags, or Events Tags) and then click the plus (+) icon next to that category to open a drop-down menu. When you add a new Keyword tag, the Create Keyword Tag dialog box opens, as shown in the figure, where you can add information about the tag attributes. Depending on what category you choose, the information you fill into the dialog box varies. For example, when you add a new tag in the Keywords category, the Create Keyword Tag dialog box provides options for editing the tag icon, specifying a category, typing a name, and adding comments. If you add a People tag, you type a person’s name and choose a group such as family, friends, and so on. If you add a Places tag, you can choose to map the location. If you add an Event tag, you type the tags for the event, choose dates, and add a description. Hence, the attributes change according to the type of tag you create. In this example, a new tag is added to the Keywords category. Click the Category drop-down menu and choose one of the preset categories listed in the menu. Click a photo and Shift-click another photo to select photos in a group. Click a photo and Ctrl-click (Cmd-click) different photos scattered around the Organizer to select nonsequential photos. 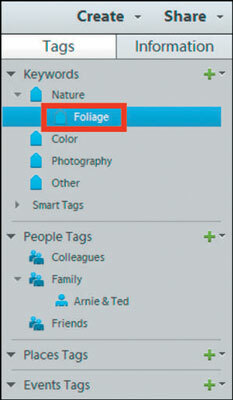 To add a new tag to a photo (or selection of photos), click one of the selected photos in the Organizer and the plus (+) symbol in the Tags panel shown in the figure, or drag the photos to the tag in the panel. When you release the mouse button, the photos are added to the new tag. Repeat Steps 2 through 6 to create tags for all the images you want to organize. Tags help you in many ways. The more you become familiar with tagging photos, the more opportunities you have for sorting and finding photos and adding found photos to albums. You should play with the Tags panel and explore creating tags and tagging photos in each of the different categories.